Tugtar an Reifirméisean (nó an tAthleasú Creidimh) ar ghluaiseacht a thosaigh sa 16ú haois le leas a chuir ar an Eaglais Chaitliceach, ach a d´fhág an Eoraip scoilte i dtaobh cleachtadh creidimh. B’iad seo na ceisteanna ba mhó a phléigh Mairtín Liútar ina chuid Téiseanna – cúig cinn déag agus ceithre scór díobh san iomlán (ar dhoras ardeaglais Wittenberg na Gearmáine sa bhliain 1517) – agus ba leor iad le tús a chur leis an Reifirméisean. Tugtar eaglaisí Protastúnacha, go ginearálta, ar na heaglaisí a scoilt ón gCaitliceachas as seo amach, ar nós Liútarachas, Anabaisteachas agus eaglaisí leasaithe Protastúnacha. Ba é an tAcht Athchóirithe, dá ngairmtear an Leasú Protastúnach, go sonrach as an Eaglais Chaitliceach a chuir Martin Luther tús leis. Lean John Calvin, Huldrych Zwingli, agus Athchóirithe Prótastúnacha eile san Eoraip sa 16ú haois ar aghaidh. De ghnáth, meastar gur thosaigh an Reifirméisean ar an 31 Deireadh Fómhair 1517 nuair a ghreamaigh Luther a chuid Téiseanna (fabhalscéal a atá ann; scríobh sé litir chuig easpag Mainz ar dtús). Mhair an Reifirméisean go dtí deireadh an Chogaidh tríocha bliain le Síocháin Westphalia i 1648. Bhí iarrachtaí suntasacha déanta ann chun an Eaglais Chaitliceach a athchóiriú roimh Luther - mar shampla iad siúd Jan Hus, Peter Waldo, agus John Wycliffe. Ansin thosaigh Luther ag cáineadh díolachán a dhíol, agus ag rá nach raibh aon fhoinse ag an teagasc Caitliceach ar fhiúntais na naoimh sa Bhíobla, srl. D'fhéadfadh an seasamh Protastúnach, áfach, athruithe foirceadail a ionchorprú, mar shampla go n-iontaofaí go hiomlán ar an Scrioptúr mar fhoinse creidimh chuí (scriptura amháin) agus an chreidiúint gurb é an creideamh in Íosa, agus nach oibreacha maith é, an t-aon bhealach chun pardún Dé a fháil do pheaca (sola fide). Bhí an spreagadh lárnach taobh thiar de na hathruithe seo diadheolaíoch, cé go raibh go leor fachtóirí eile mar chuid de, lena n-áirítear méadú ar náisiúntacht, Sásachas an Iarthair a chuir meath ar an gcreideamh sa Phápacht, an truailliú a bhí ar an Curia Rómhánach, tionchar an chine daonna, agus an fhoghlaim nua den Renaissance a cheistiú go leor smaointe traidisiúnta. 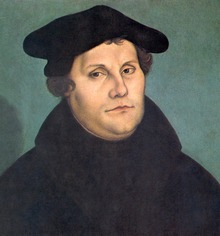 Tháinig an ghluaiseacht tosaigh laistigh den Ghearmáin éagsúlú, agus spreagadh athchóirithe eile go neamhspleách ar Luther. Chuir scaipeadh phreas clódóireachta Gutenberg ar fáil chun na hacmhainní reiligiúnacha a scaipeadh go tapa sa dúchasach. Ba iad na Liútaraigh agus na Cailvínigh na grúpaí is mó. Bunaíodh na heaglaisí Liútarach den chuid is mó sa Ghearmáin, sa Baltalt agus i gCeanacha Lochlann, agus bunaíodh na cinn athchóirithe san Eilvéis, san Ungáir, sa Fhrainc, san Ísiltír agus in Albain. Thionchar an ghluaiseacht ar Eaglais Shasana go déanach tar éis 1547 faoi Edward VI agus Elizabeth I, cé go raibh Eaglais Shasana neamhspleách faoi Henry VIII go luath sna 1530idí. Bhí gluaiseachtaí athchóirithe ann ar fud na mór-roinne Eorpaí ar a dtugtar an tAcht Athchóirithe Radacach, rud a d'eascair na gluaiseachtaí Anabaisteach, Morávach, Diaigínteach srl. Rinne Athchóirithe Radacacha, seachas pobail a bheith lasmuigh de smachtbhannaí stáit, a úsáidtear go minic athrú doctrinal níos cruaiche, mar shampla diúltú na ndlúthchomhairleanna déag d'Nicaea agus Chalcedon. D'fhreagair an Eaglais Chaitliceach le Frith-Athchóiriú a thionscnaigh Comhairle Trent. Rinne an t-ordú nua eagraithe de na hIosánaigh go mór le hobair ar an Protastúnach. Go ginearálta, tháinig Tuaisceart na hEorpa, seachas an chuid is mó d'Éirinn, faoi thionchar na Protastúnach. D'fhan an Deiscirt na hEorpa Caitliceach, agus b'ionann an Lár-Eoraip suíomh coimhlinte fíochmhar, rud a tháinig chun críche i gCogadh na Tríocha Bliana, rud a d'fhág sé go raibh sé díogtha. Tugadh an leathanach seo cothrom le dáta an 15 Samhain 2018 ag 15:51.